JAKARTA, Indonesia — The imprisonment of a Christian politician for blaspheming Islam has triggered an outpouring of anger and support around Indonesia. 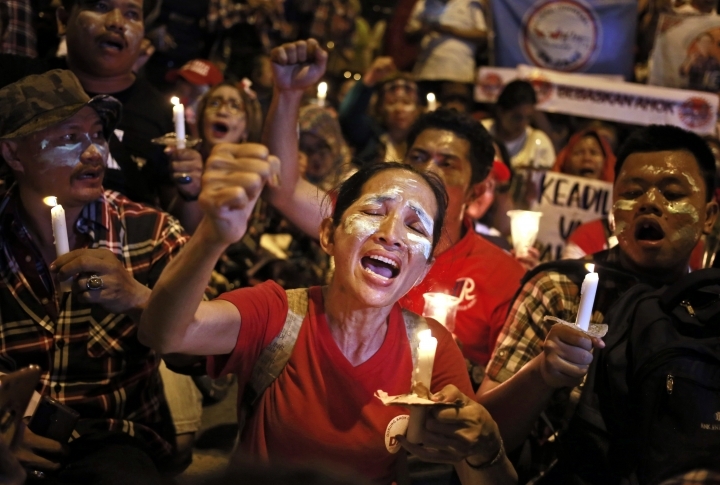 Nightly candlelight vigils have been held in cities across the sprawling archipelago since Tuesday when the governor of the capital Jakarta, Basuki "Ahok" Tjahaja Purnama, was found guilty and sentenced to two years prison. Months of huge protests against Ahok by Islamic hardliners and the unexpectedly severe sentence have undermined the reputation of Indonesia, the world's most populous Muslim nation, for practicing a moderate form of Islam. Indonesians abroad also held vigils in cities including Amsterdam, Toronto and Melbourne, Australia. Ahok was moved to a detention center outside Jakarta after thousands of supporters converged Tuesday on the high-security prison in the capital where he was initially sent. His lawyers plan to appeal. The U.S. State Department, U.N. Human Rights Office, Amnesty International and the U.K. ambassador to Indonesia have criticized the sentence, which was imposed despite prosecutors downgrading the original charges and seeking a non-custodial sentence of two years of probation. The blasphemy case was a decisive factor in Ahok's defeat to a Muslim candidate in last month's election for Jakarta governor. Hard-line Islamic groups opposed to having a non-Muslim leader for the city capitalized on the blasphemy controversy to draw hundreds of thousands to anti-Ahok protests in Jakarta that shook the centrist government of President Joko "Jokowi" Widodo. The blasphemy accusation engulfed Ahok in September after a video surfaced of him telling voters they were being deceived by opponents who said a specific verse in the Quran prohibited Muslims from voting for a non-Muslim leader.